4. 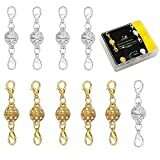 Make your life a lot easier with these super strong magnetic jewelry clasps,and two Lobster Clasp are easier to use.High grade plastic box packing, convenient storage. 5. Just attach these magnetic clasps to your favorite piece of jewelry, snap open, snap closed, and you're done! It's that easy!